32 Float™ is the first fully featured 32-bit color editing plug-in for Adobe® Photoshop® based on Beyond RGB™ color space. 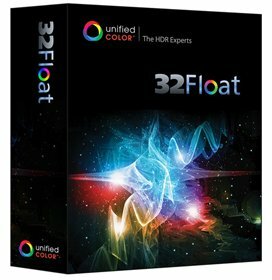 With 32 Float you can adjust color, brightness and contrast while maintaining a full 32-bit workflow. It accepts 32-bit HDR or 8/16 LDR images from any application and can produce crisp, photo-realistic images without halos or color shifts. This digital photography software package includes the Photoshop filter plug-in and the BEF file format plug-in for CS3, CS4 and CS5. • Provides unprecedented 32-bit image editing tools for Photoshop via filter plug-in. • Compatible with Photoshop CS3, CS4 & CS5. • Full support for 64-bit computing architecture (x64) on Mac and Windows. • Enables local HDR editing on 32-bit images via layer masks prior to tone mapping or return tone mapped images to 16 or 8-bit to Photoshop. • Accepts 8, 16 & 32-bit RGB images as input from any source in Photoshop. • HDR image brightness histogram with visible range indicator and digital readout for RGB and Bch values. • Based on Unified Color’s patented Beyond RGB™ color model, allowing for tonal adjustments without color shifts or halos. • Adjust HDR tonal range with Brightness/Contrast, Local Contrast, Shadow/Highlight and Veiling Glare correction tools. • Adjust HDR color with White Balance, Saturation and Selective Color Tuning Controls. • Best of class halo reduction algorithms. • Perform Sharpening and Noise Reduction on 32-bit Images. • Single click Dynamic Range Mapping tool. • Save favorite settings as presets. • Save favorite processing steps as recipes to apply to other images.